GP (MF) Memphis was this weekend. You wouldn’t really know by checking DailyMTG; they got rid of the coverage section it seems. The ‘Events’ header is still there, but not the coverage subheader. I’m sure if you went looking for all the old coverages they’re in there somewhere, but importantly, if you land on the site, you’d mostly have no idea that a large event occurred this weekend. In order to get the deets on the decklists (and winner), I had to check CFB’s site. Which, by the way, also isn’t really set up to display this sort of information. The GP coverage is in with the articles, and already pushed below the fold by Monday morning’s crop. Which is all a shame, really, since the top lists had some great variety. Sure there was a Nexus build, but there was also Mono-Blue Tempo, Gruul Midrange, Rakdos Midrange, Sultai Midrange…ok, maybe it was fairly midrange heavy. Still, a lot less people are going to know what happened at each GP. Not only is that a bummer, it means a lot less people are going to know when a cool card shows up and performs well. Which then means that even if it’s a good spec, it still might not go anywhere, because the data may not be there for people to look at and realize they should be sleeving copies. Maybe. 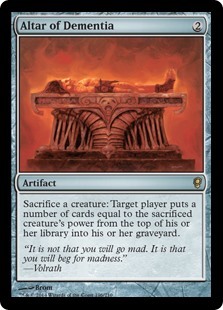 In case you’ve forgotten, Altar of Dementia was in Conspiracy. It’s a useful card with a low cost. 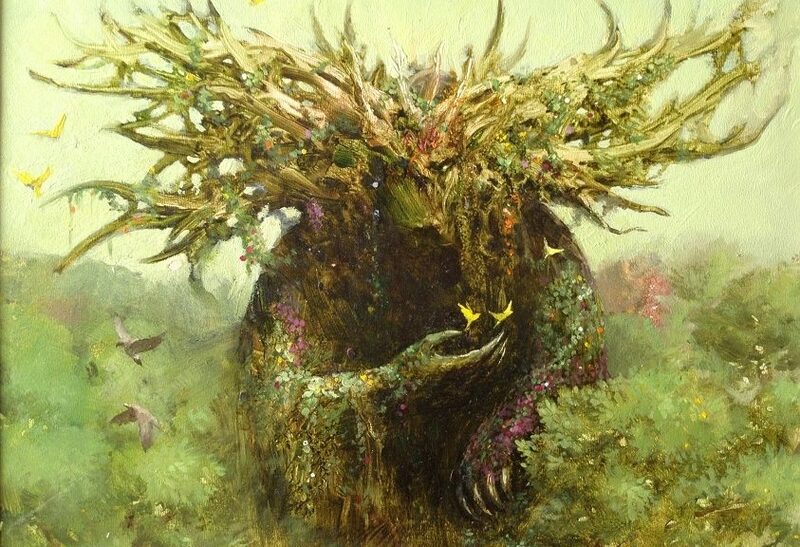 Milling your opponents out is a choice, especially if you’ve got a way to generate humongous or arbitrarily large creatures. 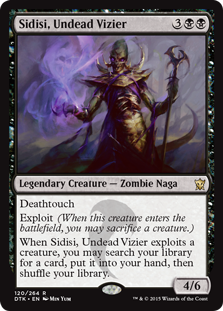 You can target yourself, digging for specific cards in your graveyard, or looking for triggers, such as Sidisi may want you to. 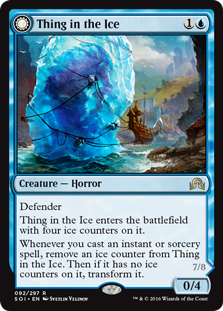 You’re also provided a free , instant-speed tool to remove creatures you control from the board, which has all sorts of uses: eating creatures you temporarily stole, killing them in response to animation triggers, exile effects, threatens, etc. 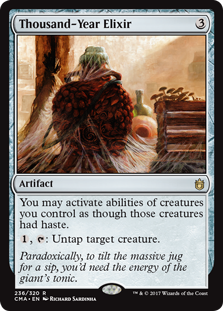 While raw power level of milling a few cards is questionable, the utility of being able to sacrifice creatures on demand is secretly quite useful. Conspiracy was nearly five years ago now, believe it or not. This summer’s product is also slated to be “Modern relevant,” or something similar to that. 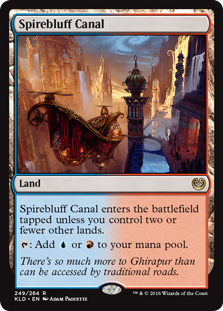 As best as I can tell, that Modern product is in the same slot that would be Conspiracy, Battlebond, etc. Conspiracy may return next year, but that’s, well, next year. Until then, where else are you going to see foil Altar of Dementias appear? Foils are about $13 right now, but chances are you’ll pay closer to $15 unless you’re the first person to read this. Still, with how low supply is looking, I don’t think that’s bad news for you. 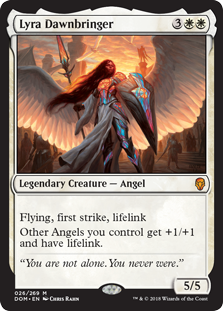 With the card’s popularity in EDH (8.5k+ decks), the new demand coming from Teysa, and how unlikely we are to see this again anytime soon, prices should keep rising on foils. While it hasn’t been on anyone’s lips in the general Magic community lately, Lord Windgrace has been a consistent performer on EDHREC. He’s 3rd or 4th on the most-built month after month, and frankly, that isn’t going to change. People love lands-matter as an EDH theme, and with so many new tools printed over the last few years, and more coming each set, that draw is only getting stronger. Gitrog Monster really kicked it off, and Windgrace has opened the door to a third color. 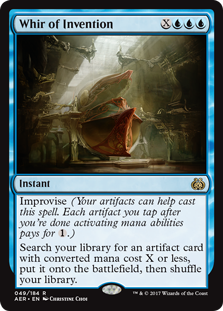 Splendid Reclamation is now in just under 8k decks, which for a card only a few years old is fairly impressive. 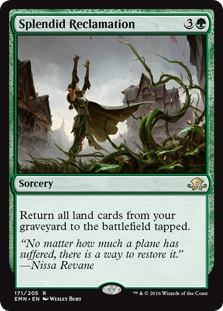 As an EDH card, Reclamation has proven powerful and useful in strategies that can leverage it. We know that isn’t going to change. 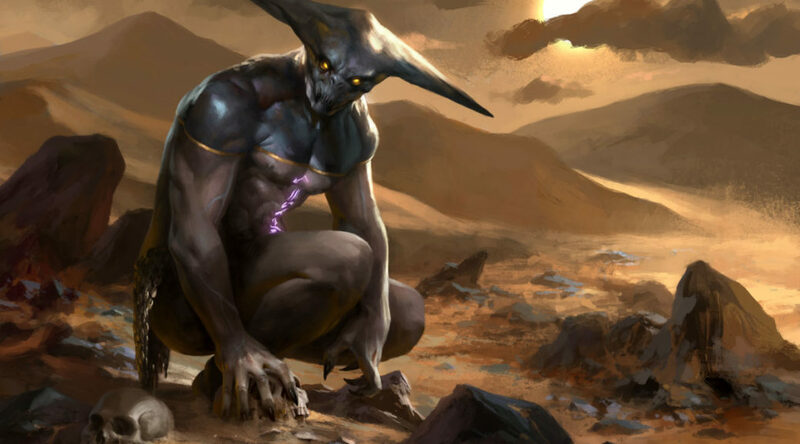 Reclamation also gets eyeballed in Modern every now and then as a potential combo piece. If you can dump 20 cards into your graveyard in a turn or two and then Reclamation, you’re generating a great deal of mana that you can then use to do something else cool with all the stuff you left behind. Maybe a deck never materializes, but it’s worth being aware of the potential. Could this show up again somewhere? Yeah, probably. Realistically, just about anywhere. The name isn’t domain specific, and the ability is mechanically universal, so there’s nothing restricting its printing. The same could be said of most cards though, right? Many cards are technically reprint candidates every set, but they aren’t, because there’s only ~40 rares a set and WotC doesn’t want to and doesn’t need to reprint everything anyone may want to buy. 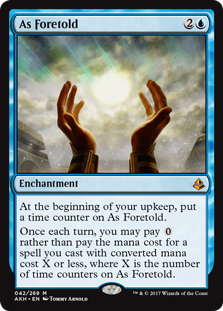 Foils at $6 are appealing, since every couple of Windgrace players are going to go looking for one, and the outside Modern combo shot is valid. This is basically on Oracle of Mul Daya trajectory, assuming nothing interferes. There’s one guy with 33 copies, which is a speedbump, but other than that, there’s not a lot out there. 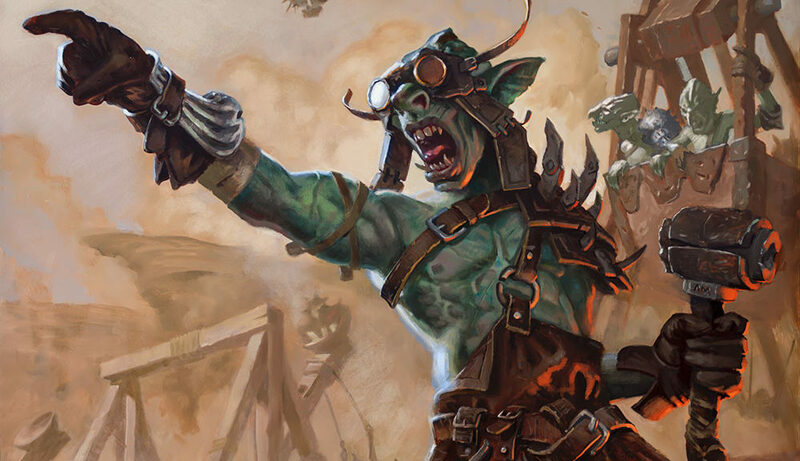 If you’ve been listening to MTG Fast Finance the last week or two, you’ll know that we’ve got a read (and we’re hardly unique in this regard) that War of the Spark, the final Ravnica set, is going to be planeswalker themed. I won’t explain why here, listen to the cast for that. It’s the presumption we’re operating on though. 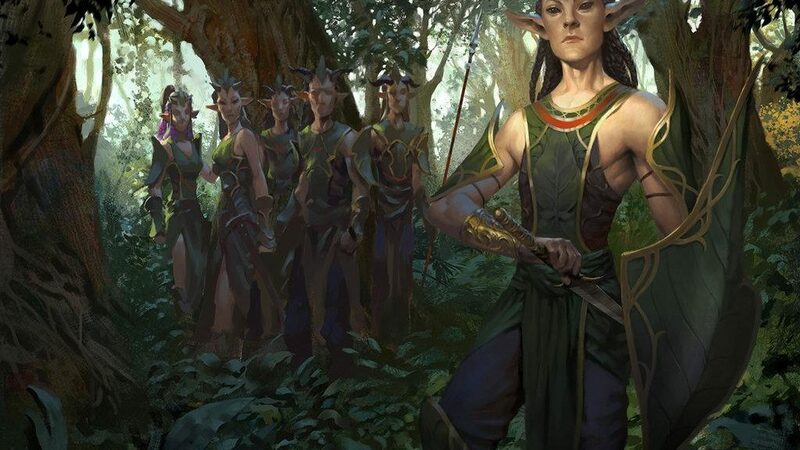 From that starting point, we want to look at cards that support planeswalker strategies, since a deluge of planeswalkers is going to draw attention to those types. There’s no shortage of options out there, and we’ve discussed some of them before. Today, we’re looking at Skate. 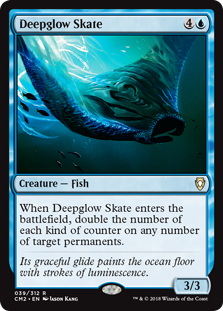 It’s hard to imagine a better tool than Deepglow Skate in a planeswalker deck. It doubles the number of counters not on one permanent, but any number. Any number! Have four walkers in play? There’s a good chance you probably just got the ultimate them all after playing Skate. That is so absurd. And as a creature, there’s infinite ways to rebuy that Skate trigger, so that you can keep doing it. Winning a game with six or seven emblems is awfully cool. Supply is available, but not deep. There’s 50 or 60 on TCG, and then roughly that many on SCG too. That’s a fair bit, for sure, but when you consider how many people may start building walker decks after a set with 7, or 15, or 30 hits shelves, you can see how 100 copies of Skate could go out the window right quick.